WOW. First and foremost, I cannot emphasize enough that WOW, this book was amazing to me. You know how you read something and it speaks to you powerfully? It can be a quote, a meme, a book, an article, whatever. It can be anything, but it just speaks to you so intensely? That's what this book did to me and for me. The Battle Plan for Prayer by Stephen & Alex Kendrick spoke volumes to me on a daily basis that left me in tears most days. Maybe I needed to hear the messages. Maybe I needed the instruction on how to pray and why it's important. Maybe I needed to feel God speaking to me so clearly I could feel it in my bones. Whatever it may have been, it was powerful. I've decided that as I finish the books I list/recommend that I should give a summary of them for you as it may compel you to want to read them. I will also eventually go back to re-read and provide a review of all of the ones I've listed that I loved...eventually. In the mean time, feel free to email me with any questions you may have about a particular book. There is so much information out there to help us with out lives, relationships, marriages, and faith in the Lord that I cannot help myself but feel enthusiastic to share. I have thought for a while and admitted on a few occasions to my friends that I wish I knew how to pray better, more powerfully, and how to use more descriptive words when I pray. I had never even heard of this book when my dear friend, Elizabeth, gave me this as a gift for my baptism in August. The book is designed to be read one chapter a day. I kept it at work and read it during lunch every day...it took longer than it should have because of travel and weekends. Yet, every day that I read a chapter I literally sat with my mouth agape in astonishment at the intense feeling of love and understanding I felt while reading this book. My hats off to the authors for compiling these thoughts, logic, and instruction so well. The Battle Plan for Prayer starts out by explaining where prayer derived from, it's purpose, and why it should be a priority in our lives. Prayer is our weapon against the enemy and it is how we communicate DIRECTLY with God. He hears us, always. He knows our hearts, our minds, our thoughts. Yet, He wants us to come directly to him to talk with Him and ask specifically for what we need and want. The book explains that when we pray first, we change from reacting defensively to what's happening to us and move into being offensive in seeking first the Kingdom of God and preemptively protecting ourselves with prayer. We are to have faith that prayer can and will work miracles. 1 Thessalonians 5:17 instructs us to pray without ceasing. We are able to surrender our fears and concerns to God's will, knowing and trusting that He hears us and will answer our prayers regardless if it is in our timing or to our desires. God answers prayers in His timing and to His will. Surrendering our concerns in prayer provides us with God's peace in our hearts in trusting that His will will be done. It may not always feel good, it may hurt that we do not receive the immediate outcome we ask for, but God is working for us to provide the BEST for us at all times. We are to prioritize praying every day both scheduled and non-scheduled because God is to be our number one priority. In praying we are glorifying Him. The requests we make should glorify Him, in everything. The book goes on to discuss what constitutes prayer, the types of prayer that are possible, and God's answers to prayer. Yes, yes, and yes. These were so powerful for me. Prayer is our communication with God, as I said above. That is it, simply. And we NEED that! I hadn't though of it prior to reading this book, but what a gift we have...a blessing...to be able to talk to Him. The acronym the book provides on the types of prayer is ACTS: Adoration, Confession, Thanksgiving, and Supplication. Does it feel as rational to you as it does to me? Yet, I had not thought of these. We are to adore Him, give him glory and admiration for who He is and what He's done. We are to confess our sins and acknowledge where we need help. We are to be grateful and thankful for everything He has done for us (and NOT done for us!). We are to ask him directly for the things we need and want most, while acknowledging that it is up to Him to provide if it is His will. That may be the hardest one for us all, right? His will, His timing, His decision. We want what we want and feel we deserve it right now. God does not always agree with that, and He has His purpose for it too! The Battle Plan for Prayer reviews how God answers our prayers. Perfect timing right? I don't want to give away one of the best sections of the book, so I will limit what I say. But it explains that God has FIVE main answers to our prayers. Yes, immediately. Yes, in due time. Yes, only so you'll learn from it. No, because YOUR heart (intent) isn't right. And no, He has a better plan. All the yes's from me here again. I have been in every stage of God's response, and it all makes perfect sense! I may not have known at the time, and I may not currently get it in the moment. But, these five answers precisely summarize what we can expect. The book moves on to detail when and how we should pray whether scheduled or spontaneous. We should always pray! Get it out of your heart. He is listening. They provide the ways in which we should pray and what we need to include and who we need to pray for. This was eye opening for me, truly. These were things I knew in my heart but could not verbalize or put into words without having seen them before. It goes on to discuss pride versus humility in prayer, how we present ourselves to the Lord makes a huge difference! Do you come to Him thinking you don't really need him? Do you come to him knowing you cannot do anything without him? It makes a difference. And so does praying in unity with others. When two or more are united in prayer, Jesus is present and listening. How about praying in faith versus praying with doubt that your prayers can be answered. It makes a difference! We must have strong faith and courage that God CAN and WILL answer our prayers. Regardless of the request, He can absolutely perform miracles! It also matters whether we are patient for His will in His timing and if we're persistent in creating our own will. He wants us to keep praying, keep asking, and to keep seeking Him. It continues to say we need to pray using the word of God, and using God's many names as it is befitting to the situation. The book explains so much more, I hate to give it all away. 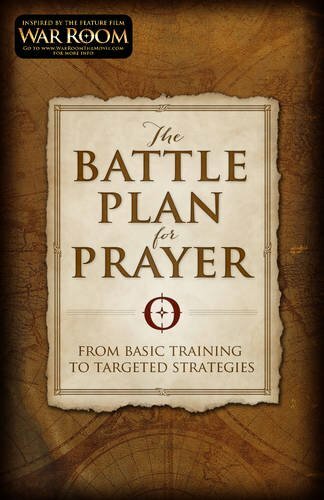 I am sure you can tell by my enthusiasm that I thought The Battle Plan for Prayer was a great book for countless reasons. It is helpful and insightful, it provides instruction and clarity, it also provides an understanding and connection for us to God. If you've wondered about your prayers being heard, or if they're powerful enough, or how to say a prayer to be the most effective, this book will help you. I hope you find yourself picking it up one day, or giving it as a gift to someone you love. The holidays are around the corner, and this could be a perfect gift.